The five-step process for treating a muscle or joint injury such as an ankle sprain is called "P.R.I.C.E." which is short for Protection, Rest, Ice, Compression, and Elevation). It can be used even by someone without first-aid training, and should be used immediately when an injury occurs – the earlier, the better – while further medical attention is being sought. If the athlete experiences too much pain during the process, stop immediately. Protect the injured person and the area being treated but also protect yourself. If the injury occurs on the sports field, stop the game. Protect the area being treated with a splint if possible. If the athlete can move, carefully move them to a safer area using a stretcher or a crutch, but if there is any doubt, do not move the injured athlete. When a child is injured, the body responds in an effort to defend, localize, protect, and clean up the injured area, a response called inflammation. At the time of injury small blood vessels at the injury site rupture and cause tissue bleeding, which, in turn, can cause bruising and swelling. Not every injury exhibits all these signs, but if your child is in pain then it is important to stop exercising immediately to avoid further damage. As soon as possible after injury, begin applying ice continuously for the first 15-20 minutes to decrease swelling and pain. An ice bag can be applied directly to the skin (except on the outside of the knee) unless the child has a known cold allergy. The safest form of icing is to use a plastic bag with ice cubes or crushed ice, or instant cold packs. Do not use “blue ice” or “gel packs”. While icing will be uncomfortable at first, in 2 to 3 minutes, the skin will go numb and the ice bag will feel more comfortable. If the child is very uncomfortable with ice bag, then a barrier like a wet towel can be placed between the ice and skin. The ice bag can be secured in place using an elastic bandage, but the compression should not be too tight. During the application of the ice, ask the child to wiggle their fingers/toes and monitor tissue around area that is being iced to ensure that they are not experiencing a lost of sensation. Icing for 15-20 minutes with an ice bag is unlikely to cause nerve damage or frostbite; however, any loss of sensation and any changes in tissue coloration in areas other than the area that is being iced indicate that the application is no longer safe. Because ice and plastic bags are so important, make sure that someone brings these to every practice and game. Better yet, to be on the safe side, bring your own! After icing, to further prevent swelling, wrap the injured area with an elastic bandage or compression sleeve. Take the wrap and start farthest away from the injured body part to the heart. Continuously wrap, always making sure to cover half of the previously wrapped area. As you get closer to the end of the wrap, you don’t need to wrap as tightly. You will know you have wrapped correctly when the hurt part ends up in the middle of the wrap. Tension should be firm but still comfortable. Tingling or pain means it’s too tight. 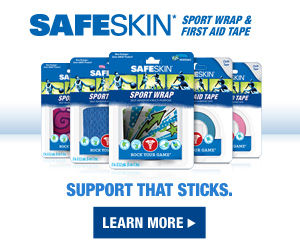 Incorrect application of an elastic wrap could cause further pain and damage and delay healing. For both upper and lower limb injuries, it is equally important to keep the limb elevated to minimize swelling. Elevation to the level of the heart or above allows for excess fluid to be pumped back into the blood vessel system and will help prevent further swelling from occurring. In addition to protection, rest, ice, compression, and elevation, restoring range of motion (ROM) is an important part of the recovery process when the swelling and pain begins to subside. Active ROM of an injured joint assists in introducing new blood flow to the injury site to "flush" out any residual cellular waste and joint edema present. Motion also assists in decreasing scar tissue and adhesion formation and stimulates the nervous system to begin activating the muscles that control strength, balance, and proprioception (position-movement sensation or body awareness) when return to play occurs. An athlete experiencing pain or swelling upon return to play or during rehab prior to play should seek the advice of a physician for further evaluation and/or diagnostic testing.